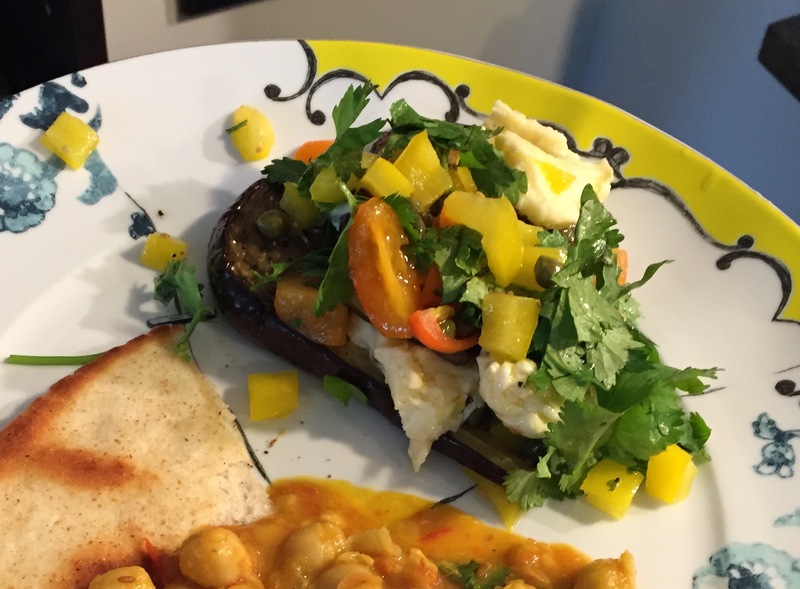 Eggplant Tricolore – One Half Indian. This dish is from Plenty by Yottam Ottolenghi, but it is really a traditional Italian recipe. I was served versions of this dish at several homes and restaurants when I stayed in Northern Italy. My cousin who came for lunch told me that she didn’t like eggplant, but that she loved this dish. All this is to say that it is a tried and true classic. The dish is served room temperature and works as a kind of salad in my opinion. Hearty enough to be the main dish yet light and acidic to work as a nice side. This dish is traditionally served with basil, but Ottolenghi uses cilantro instead. I think it would be great with a mix of basil and cilantro, and maybe even mint. 2. Slice the eggplant about 1/2-3/4 inch thick. Brush both sides of the eggplant with a generous amount of olive oil and salt and pepper. 3. 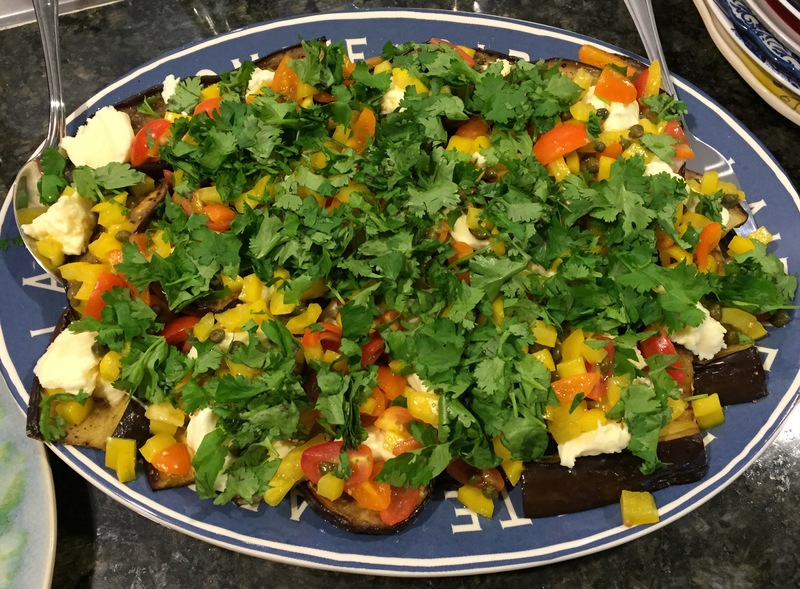 Bake the eggplant for 20-30 minutes. I like to see a bit of brown on the top my eggplant. If your eggplant isn’t browning much after 25 mins, turn the broil on for 2 mins and then remove. Set the eggplant aside and let cool to room temperature. 4. Mix together the peppers, tomatoes, vinegar, capers, and brine. Let this mix sit together for at least 30 minutes. You could make this up to a few days before and the flavors will deepen. If you make ahead, take the mix out of the fridge 30-60 minutes before serving. 5. Arrange the eggplant slightly overlapping on a serving platter. Tear the mozzarella into pieces and disperse on top of eggplant. Spoon the yellow pepper and tomato mix over the eggplants. Top it with cilantro.